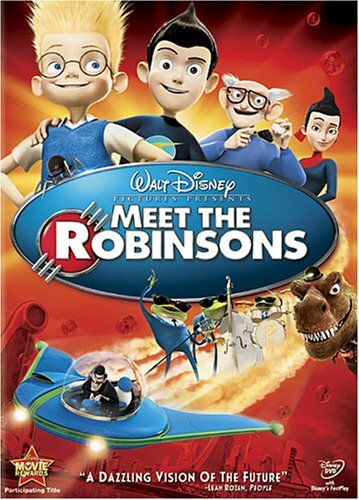 It baffles me how Meet the Robinsons flies under the radar as one of Disney‘s best animated works. I’d go so far as to call it their best film within the last ten years, certainly their best in the first ten years of the 2000s. The odds weren’t in its favor from the beginning, it being the first project from Walt Disney Animation Studios, an off-shoot studio created to bolster the animation department after the departure of PIXAR. We all know PIXAR didn’t stay away too long, and once they returned John Lasseter had over 60% of this project re-scripted and animated. With all its production issues, Meet the Robinsons is a tender look at family and technology, hearkening back to the Disney of old. This is the Disney movie to connect you back to where Disney started, and it’s a shame it fails to get the recognition it deserves. Lewis (voiced by Daniel Hansen and Jordan Fry) is an orphan desperate to find his birth mother. After a failed experiment proves to be another disappointment, Lewis’ life changes when a mysterious boy named Wilbur (voiced by Wesley Singerman) arrives from the future. With Wilbur’s help, Lewis learns about family and saves the world from destruction at the hands of a vicious bowler hat. Meet the Robinsons has a lot in common with Lilo & Stitch, wherein both feature orphaned characters who meet futuristic friends who change their lives. Where Lilo & Stitch focuses on social workers, Lewis has been growing up in an orphanage and fails to impress the various families who show up. In a moment of frustration with everything, he decides to create a machine to see his birth mother. You might expect the mother to play a large role, but she’s a Macguffin for the rest of the film. At its heart, director Stephen J. Anderson tells a tale of belonging (himself an orphan who grew up questioning his identity). Take away the futuristic set pieces, and Lewis is a boy looking for his family. To go even further, the movie’s emphasis on technology and moving forward acts as a metaphor for Disney animation seeking its own place in a world CGI and 3D (both of which this movie employs). The CGI presentation here is fantastic, if only because it isn’t trying to be realistic. The movie’s aesthetic is reminiscent of 1950s/1960s comic books and cartoons. The closest comparison is (one cheekily presented within the film itself) Walt Disney’s original plans for Tomorrowland. The smooth lines, rounded trains, and kinetic colors are warm and inviting. The characters themselves are animated distinctively and are easily differentiated – a trait fading with Disney currently. If you watched this next to The Iron Giant, you’d find their kindred spirits. 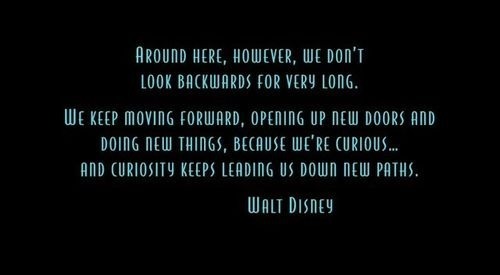 Considering the time period, and Disney’s history, it’s nice how Walt Disney is represented throughout Meet the Robinsons. After the various internal strife with CEO Michael Eisner, the loss of PIXAR, and the disbanding of the hand-drawn animation unit, it was hard to forget it all started with a mouse. Walt Disney’s inspiration within the company continues to dwindle, but Meet the Robinsons embraces him and, in a way, he is the inspiration for the character of Cornelius (alongside Tom Selleck, of course). The ending lines – a Walt Disney quote about progress show above – is a much-needed reminder of why the man and his studio are so important to families. The action never substitutes for story, and the humor is consistent, a mix of humor for kids and adults. This has to be one of the funniest scripts for a Disney film since Lilo & Stitch; I still quote lines from this film: “I have a big head and little arms.” “Bake them cookies, Lucille!” It’s also important to take note of the absence of A-list talent in the voice cast! Yes, there are name actors like Tom Selleck as Cornelius, Adam West as Uncle Art, Harland Williams as Carl, Nicole Sullivan as Franny and Laurie Metcalf as Lucille, but they are the only ones with any type of outright name recognition. The various tones of voice create individuality, and Meet the Robinsons is one movie where all the characters are memorable whether they’re the leads or not. My personal favorite is the character of Mike “Goob” Yagoobian, Lewis’ exhausted roommate. He’s animated adorably with dark rings under his eyes and a lisp you can actually see. He’s a Lilo-esque character with his dour attitude, but he’s so adorable you can’t help but love him. As he laments, “Mr. 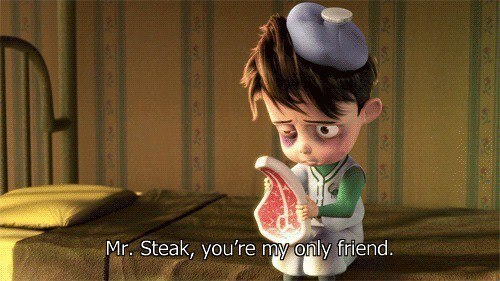 Steak, you’re my only friend,” he’s the character you’d see next to the term Schadenfreude in the dictionary. The blending of all these characters creates a family within the movie, as well as for the audience. You want all these characters to find others who understand them, and when everyone comes together by the end (with the well-placed song “Little Wonders”) it’ll bring a tear to your eye. With its frazzled production history, Meet the Robinsons shouldn’t have succeeded, but it ended up being the fourth highest grossing film of 2007. Unfortunately, it ranks low on the totem pole of Disney animated films and has zero placement in the Disney parks. It’s a film with flashy animation, but old-fashioned sensibility to story, action, and character development. In a way, it hearkens back to the early 90s and The Iron Giant; two films interested in establishing a time and a way of life complete with an engaging premise. The animation is lovely, and isn’t reliant on gimmicks; the gimmick is that the events take place in a future we can continually strive towards, but probably will never get. I adore Meet the Robinsons and it deserves a wider audience. NEXT WEEK: John Travolta and Miley Cyrus (yep) team up in the action-adventure, Bolt.